The modern open plan office environment has multiple benefits from offering a blank canvas on which to project a distinctive company identity to establishing a more sociable and equitable ambience of teamwork. However, all this can come at the cost of a sense of privacy when it is needed. 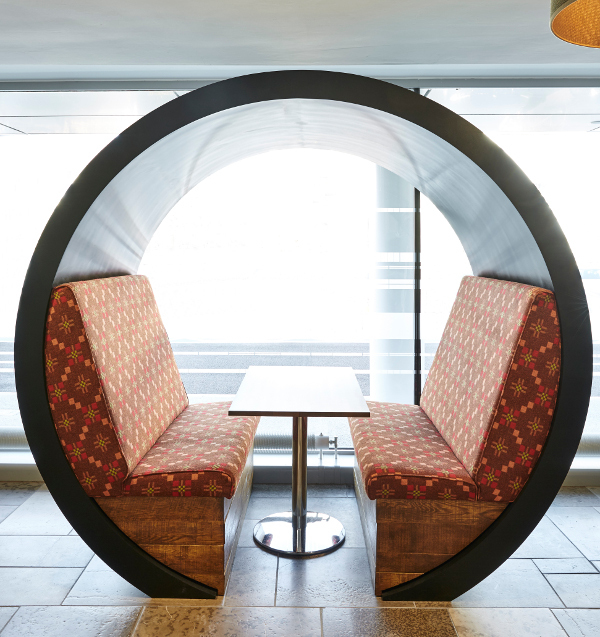 Whether used for intimate and informal meetings, relaxed break time encounters or as a cocoon in which to contemplate and create, the office ‘pod’ has become the popular answer to occupational privacy. As with many functional installations for the workplace that also serve as a high-impact design feature, one particular material is the ideal partner in producing such solutions. Allowing limitless aesthetic versatility together with robust performance, ease of maintenance and smart compatibility with technology, Corian® can answer all the key surfacing demands of distinctive commercial spaces. Meeting pods encircled in Corian® Deep Nocturne, made with Corian® DeepColour™ Technology. Sophisticated in look and feel, Corian® is equally skilful when it comes to achieving other vital objectives. Capabilities such as seamless lighting and audio-visual integration – plus the pioneering Corian® Charging Surface, which enables phones and tablets to be powered up wirelessly – make this multi-talented material the obvious choice for either a high-performance ‘thought bubble’ or a conferencing capsule. A series of breakout /meeting pods encapsulated in Corian® in Glacier White at the Bwin Party HQ. Images courtesy of Ranne Creative Interiors, all rights reserved. The very nature of a pod or cocoon suggests flowing, organic curves – an aesthetic that comes naturally to Corian®. Thermoforming techniques in combination with seamless joining can create an ergonomic sense of being cradled by something strong yet sleek, and inspiringly contemporary, yet timeless in its durability. Sleek and malleable, Corian® also offers structural strength while being relatively lightweight and very easy to install, even to discreetly repair if needed, on site. An extensive colour palette that includes several options with enhanced translucency means that a corporate identity or brand personality can be matched chromatically from within the Corian® palette. Furthermore, using a variety of decorative techniques from CNC engraving to sublimation printing, logos or other images and messages can be lastingly applied. Corian® also works well with a variety of other materials, from wood to metal to upholstery and whether in horizontal, vertical – or circular – application. photo Corian® Design / Steelcase. Skilled and experienced fabricators from the highly trained network of Corian® Industrial Partners are on hand to explore and ensure that the creative vision can be achieved. Many years of experience and an ongoing commitment to pertinent development means that Corian® comes with the back-up and know-how of a world-class science company. When it comes to working partnerships Corian® leads the field in value, elegance and reliability.